There is a really good interview over on Newsarama about the now available documentary She Makes Comics which covers the history of women in comics from the 1940s until today. 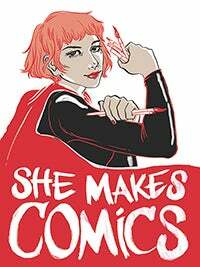 She Makes Comics is a collaborative effort by Sequart Publishing and Respect! Films which was directed by Marissa Stotter. Stotter is a relative newcomer to directing feature length films. Sequart Publishing and Respect! Films have previously collaborated on a number of comics related documentaries. In addition to this full length documentary, they will also be releasing a mini-documentary which focuses on Jackie Ormes, who was an African American artist working in comics in the early part of the 20th century. In the interview, Stotter elaborates about why Ormes is such an interesting subject for a stand alone piece. [Jackie Ormes'] story we found particularly interesting because of her personal life. She was a real star in the black press, enough of one to hobnob with prominent black celebrities of the 30s and 40s - and land on an FBI watch list for associating with alleged communists. Her story was so fascinating on numerous levels, and we felt that it wasn't enough to simply address the fact that she existed. We wanted to expand upon her story and highlight how important her contributions were to elevating depictions of middle class black life at a time when most newspaper images of African Americans were offensive stereotypes and caricatures. In addition, Stotter talks about how there was a shared set of experiences that all the subject of the documentary experienced and offers an interesting glimpse into the process of making this film. I'd definitely recommend giving the interview a read. I'm excited to be downloading this documentary and watching it in the next couple of days with my niece. I'm also looking forward to the upcoming mini-documentary on Jackie Ormes. Heck, I'll probably also download some of their other comics documentaries as well. You can download a digital version or order a DVD at Sequart.